India's swift destruction of a satellite on Wednesday turned the balance of power in Asia on its head within the space of three minutes – the time it took for the ground-to-space missile to reach its target – and raised questions over whether New Delhi intends to rethink its long-standing nuclear strategy. The decommissioned satellite was shattered into 250 pieces when it was struck while travelling at 27,000 kilometres an hour in low orbit, an estimated 300 kilometres above the ground. These pieces, which are expect to either burn up or fall back to Earth, are now being closely monitored by the US military to make sure they don't pose a threat to other satellites in orbit. While space pollution is a problem, the main worry following this strike appears to centre on what it means for the balance of power in Asia. India now joins the club of four countries who have the power to take out an enemy satellite in space using an incredibly precise missile. 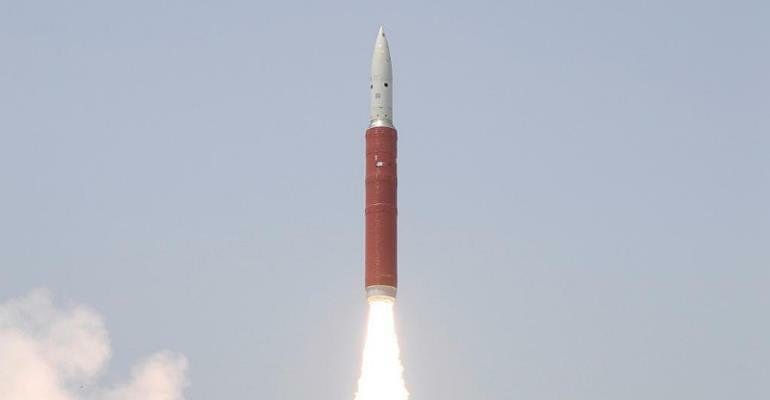 “The anti-satellite (ASAT) test is being celebrated in India, where it has widespread approval and is seen as a huge technological achievement,” says Sushant Sareen, a senior fellow at New Delhi's Observer Research Foundation. India was left with little choice but to join the space race when, in 2007, China shot down one of its own weather satellites (incidentally creating a massive field of space junk), Sareen says. It's been working away at the technology ever since. Indian Prime Minister Narendra Modi will likely be given a boost by the ASAT strike as he heads into general elections next month, safe in the knowledge that he has ramped up his country's bargaining power in the region. India has a longstanding “no first-use” nuclear policy – promising it will only strike back in defence. That strategy is now “in flux”, says Sareen. The missile has done more than just accelerate the space race with China. Experts say it has also disrupted the balance of power with Pakistan which, along with China and India, possesses nuclear arms. So what exactly does this newfound capability mean for India? Space policy expert Dr Bleddyn Bowen, of the University of Leicester in Britain, says satellites play a crucial role in modern warfare – communications, navigation and intelligence – and India now has the power to destroy them. “Because satellites are so useful for tactical and operational military activities now, there's an increasing payoff for being able to threaten those satellites in conventional war planning,” Bowen says. Bowen also points out that geopolitical logic has been pushing China to develop anti-satellite weapons – because if China is to go to war the United States “it needs to undermine the US's ability to use space for military purposes”. Of course annihilating a satellite with a ground missile is only one way to take it out. These days there are lasers, jammers and other types of high-tech non-kinetic weapons that can also do the job. “Any serious space warfare entity will want to have a spread of capabilities,” Bowen explains. “There are advantages and disadvantages to hard and soft kill – soft kill being jamming or hacking into satellites, and hard kill being either explosive or kinetic energy weapons.